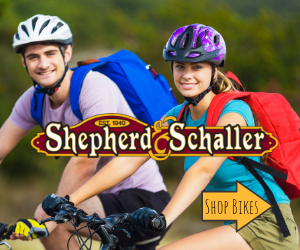 Pre-shop our bikes here, then visit Shepherd & Schaller in Downtown Wausau to chat with our friendly, expert cyclists and choose the Raleigh or Scott bike best suited to your goals and budget. Making memories is one of the best reasons to own a bike so we’ll start you off with a great one: With every bike purchase you get our Free professional assembly, a Free 30-day check-up and Free 1-year tune-up plus 20% off bike accessories like helmets, locks, lights, bells and bike clothes. Go home with a Free set of Skullcandy earbuds too (while they last.) Because a great bike with great bike service is music to your ears. We stock Scott and Raleigh bicycles in models ideal for your upgrade from big-box store bikes, without bank-breaking prices. They feature premium components, better value. Need a high-end ride? Shop early for special order Scott and Raleigh – they move fast. Only our full-time pro mechanic will touch your bike! In love with your old bike, or passing it down? Our full-service bike repair shop is in the gifted hands of the region’s most respected repair expert, Pete Kohlmoos. With more than 30 years full-time experience, your ride will be better after a visit to Pete’s repair shop. 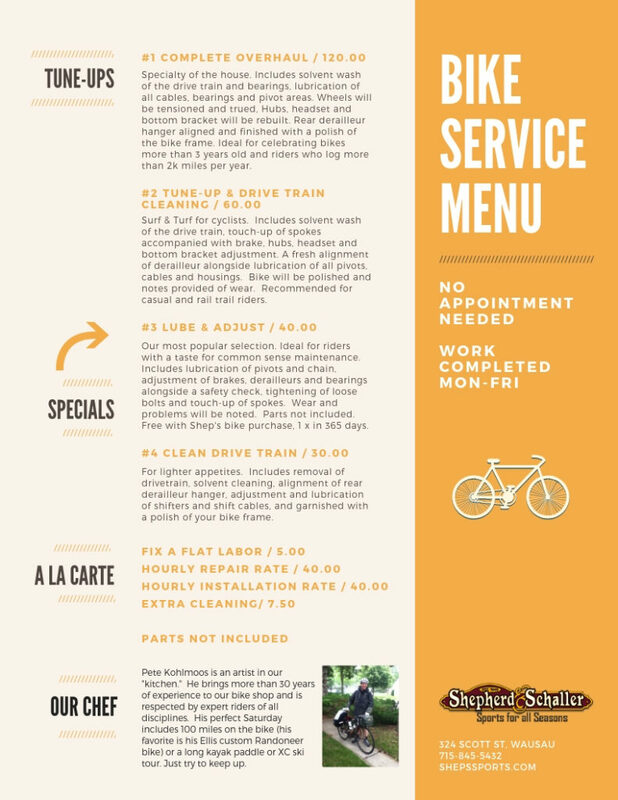 Check out our Service Menu below. Can’t visit us in person? Shop our web store or call 715-845-5432. We’ll be happy to help by phone too. 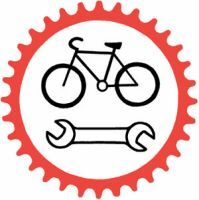 Author tshepherdPosted on April 16, 2019 April 23, 2019 Categories Back Shop Services: Repair and Tune-ups, Bikes & Biking in Central WI, UncategorizedTags Bike, Bikes, Repair, WausauLeave a comment on Making memories is the best reason to own a bike. Wausau’s Favorite Outdoor Store can help you enjoy the outdoors in any weather. Snow, Sun, Rain, Cold, Heat. None of these is a good enough reason to stay indoors when there’s work to be done or fun to be had. Dressing for the occasion and using the right gear can make the great outdoors comfortable. Wausau’s favorite outdoor store can help. We’ve been playing outside in North Central Wisconsin since 1949. We’re not only experts on the gear we sell and service, but where to use it and how to dress for success. 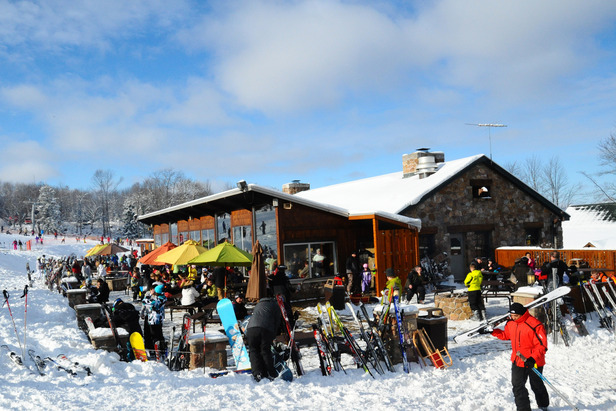 Granite Peak Ski Area in Wausau is Wisconsin’s favorite. Just minutes from Shepherd & Schaller. 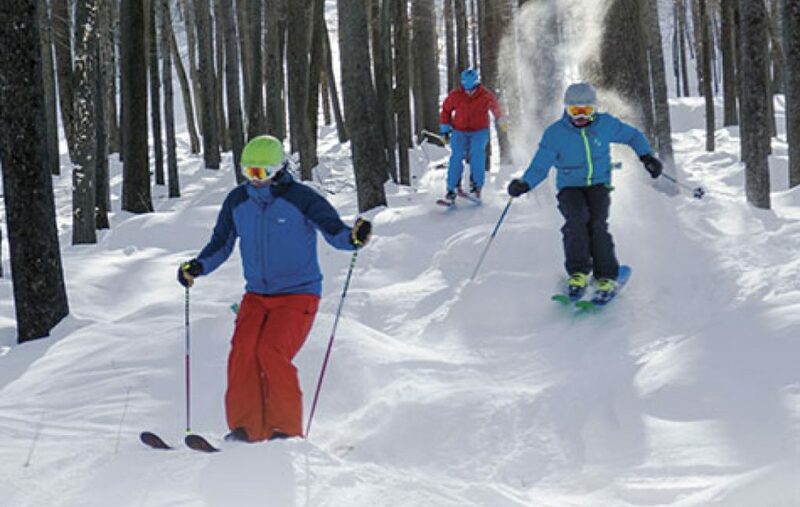 Are you looking to try skiing for the first time? Shep’s rents, sells used ski and snowboard gear and of course offers the latest new styles (our ski and boot selection is the largest in Wisconsin.) All the clothing and accessories we present make any excuse void. Seriously, try downhill skiing! Still not convinced? Anyone can snow shoe and like it, Cross Country skiing is a really inexpensive way to get great exercise and enjoy the quiet trails and woods. Snowboarding is as fun as you think it is. Honestly. Dressing for snow sports isn’t as complicated as you might think, and doing it right makes a big difference in your comfort for a full day on the slopes and trails. Get our dressing for success tips here. What length rope? How fast to drive? The answers to these questions make a difference in your safety and performance. Ask us! Making the most of hot weather? How about kayaking or a stand-up paddle board for one of our beautiful local water ways, along with sunscreen, a waterproof hat and the appropriate life jacket this is a fabulous way to make the most of any day. Access to a motor boat means you can try wake skates, water skis, wake boards and tow tubes. Want to get in the water and explore? We can recommend and fit snorkels – all these categories are available in kid’s sizes at Shep’s. Playing on and in the water is one of our favorite pastimes. We all love mild weather! Biking — fat tire, mountain, commuter, and more — we recommend and repair all of them. While the “pros” seek us out to fine tune their adventure, helping beginners is our specialty. Come ask your dummest question. We promise, no one is born knowing how to make biking a favorite activity in all kinds of weather. But we know the secrets and want to share. Let’s talk! 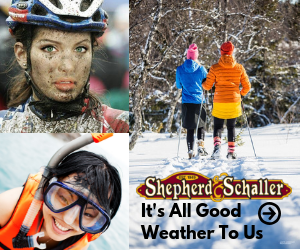 Shepherd & Schaller in downtown Wausau is where you can learn how to dress and select gear that’s right for you, in all kinds of weather. Visit us across from Wausau’s 400 Block park. Parking on site. We’ve been doing Winter in Wausau since 1949 (Happy 70th Anniversary to us!) and we’re here to help you make the best of it. Need help with the fine art of dressing in layers? Want to know why your feet are cold, even in your warmest boots? Some of your best memories can be made on the snow and in the cold so scroll down for Winter Dressing 101 and learn how the fabrics and layers you choose make a real difference in how you feel. Then visit us at 324 Scott Street, across from the 400 Block in Downtown Wausau, for personalized service and great winter gear. We love winter and we know you can too! You know that chill you get, the one that hangs on even when you’ve gone inside? We know why that happens and how to fix it! Let’s talk about the differences various fabrics make, and how to make them work together to keep you cozy, warm and dry. Think about dressing for winter like you’d choose a dwelling. What do you need to keep you comfortable? Your clothes protect you from the elements, like a house. 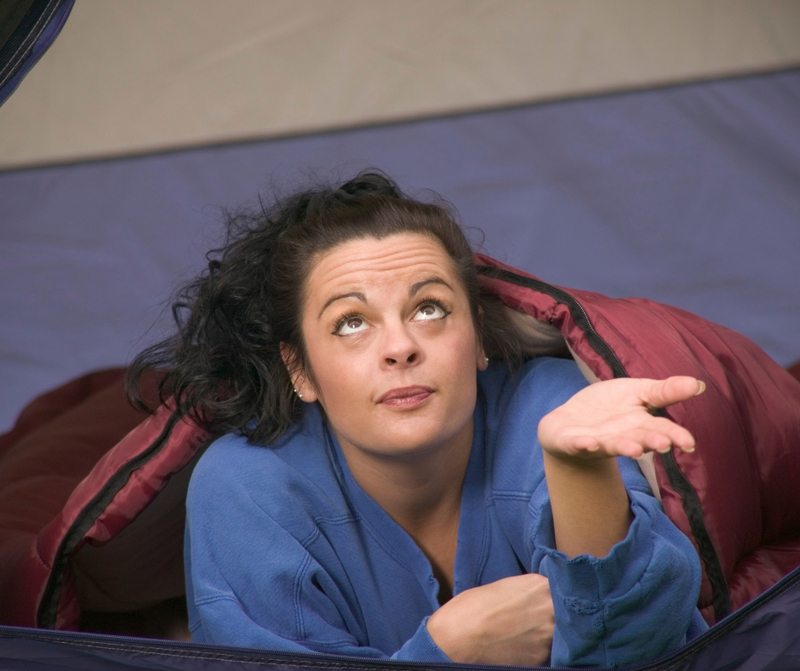 Is a tent all you need for comfort or does your environment call for something built for severe weather? What kind of insulation is between you and the elements? Just a sleeping bag or something between the walls and siding? Should you build with wood or brick? How do the other layers inside your home affect your comfort, like carpet and curtains? You get the idea. 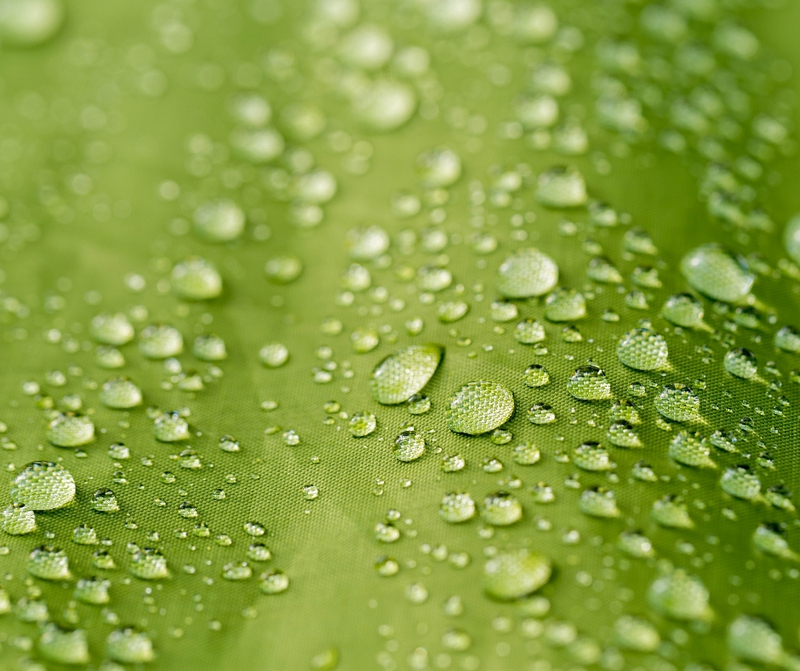 Waterproof-Breathable fabrics are achieved with technically advanced membranes, laminates and coatings. The fabric these are adhered to affects the durability and wind resistance of your garment, as well as the warmth. The key for warmth in winter weather is to stay dry. Outerwear should be labeled Waterproof-Breathable. (Not just waterproof) This is really important. Think about it: a plastic bag is waterproof, but it’s not breathable. If you wear a plastic bag as an emergency rain cover it’s only a few minutes before you feel clammy underneath. That’s because it’s trapping your body vapor or perspiration underneath. Over time you’ll be as wet on the inside as the outside. Instead, Waterproof-Breathable fabrics keep snow and rain out while letting your personal humidity evaporate. (Gortex is one brand.) A waterproof-breathable jacket or pant may or may not be insulated so what you wear underneath is just as important. 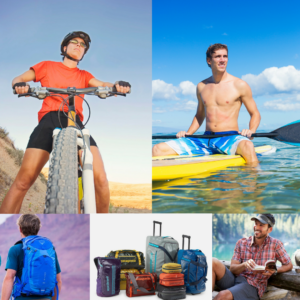 Hint: shop an Outdoor Store for these technical garments. Cotton holds moisture. This makes cotton the enemy of winter dressing. Sorry cotton! Save it for hot weather when you want to feel cooler. Fabrics next to your skin must be moisture managers for warmth in winter. The number one problem-causing fabric in your closet is cotton. Successful winter dressers know this: NO COTTON! That means no denim. Leave those great jeans in the closet when you venture outside, and never wear jeans under snow pants. Why? Cotton holds moisture, liquid and vapor. When you get cotton wet, it stays wet. When it becomes damp, it stays damp. Our bodies create moisture in a vapor state, even if we’re not actively exercising and perspiring. Have you ever rolled a cotton sock off your foot after a day in shoes, ending up with a damp, icky sock donut? Vapor + cotton is the problem. You don’t want that in winter because even if it doesn’t feel wet, cotton is holding moisture against your skin, which disperses body heat and makes you cold. Base Layer fabrics range from silk to merino wool, polyester to bamboo. What they have in common is moisture-management. Today’s base layers look good enough to wear in public. Step 1: Base Layer. We call what you wear next-to-skin Base Layer, but you may know it as long underwear. It needs to wick moisture and provide insulation, appropriate to your activity. For example, if you’re cross country skiing you can expect to sweat (there’s that moisture problem again!) A light-weight, stretch polyester or bamboo fabric that moves moisture quickly is a great way to go. Ice fishing? That requires a highly insulating fiber of course. Merino wool is our favorite because it insulates while it’s moving moisture and is flexible enough to wear year-round. In fact, it’s a miracle fiber in our opinion. Read more from the experts at Smartwool here. Socks are part of your base layer. Your Mid Layer might be a fleece or wool sweater, synthetic or down-filled jacket, or even both. What mid-layers have in common is that they insulate but don’t necessarily protect you from the elements. Step 2: Mid Layer. This is your insulation. It might be a lightweight fleece sweater, a thick wool sweater grandma made, or a buddy down-filled jacket. Wicking and insulation continue in the mid layer. Ideally, the fabric you choose here will work with your base layer. Wool, polyester fleece, natural down are all great choices for different reasons. They are all mid-layers if they are not built to keep out wind and water. This is where our great brands have come up with some awesome advancements in recent years. We can show you when you visit us! Outerwear is the exterior siding of your home in the weather. It might be a “shell” or it it could be insulated. It often has vents and special features. Step 3: Outer Layer. Your winter jacket. We finally got to it! Here you have a multitude of choices, obviously. A winter jacket, parka or pant is the garment that must help you withstand the wind, and snow or rain, and often the cold too. 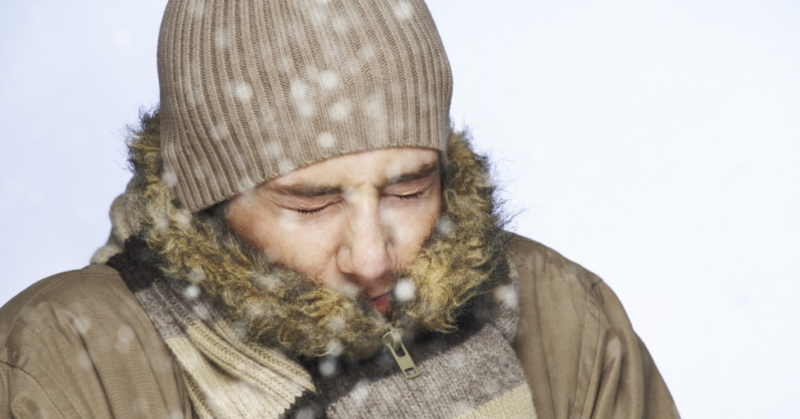 Many contain heat-trapping insulation so your body stays warm even when not in motion. 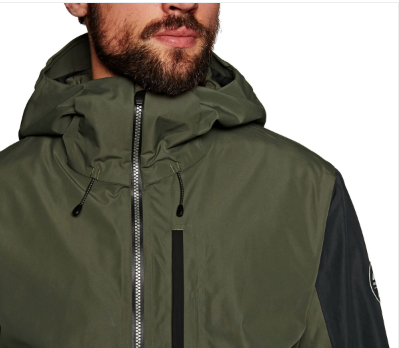 This layer must also have that waterproof/ breathable membrane/laminate we described to really keep you comfortable. You can choose a “Hard Shell” jacket, which is not insulated at all. Think rain jacket. You’ll wear different layers underneath depending on the temperature outdoors, making it really flexible and a good investment. However, most of us in Wisconsin use these in mild temperatures – 30s-50s and prefer an insulated jacket when it’s below freezing, even when we are employing the layering philosophy described here. So come see us. 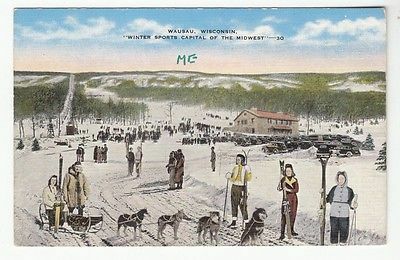 Let’s talk about winter dressing, and all the great places to enjoy the outdoors in Central Wisconsin. Discover Wisconsin thinks Winter in Wausau is the Best! 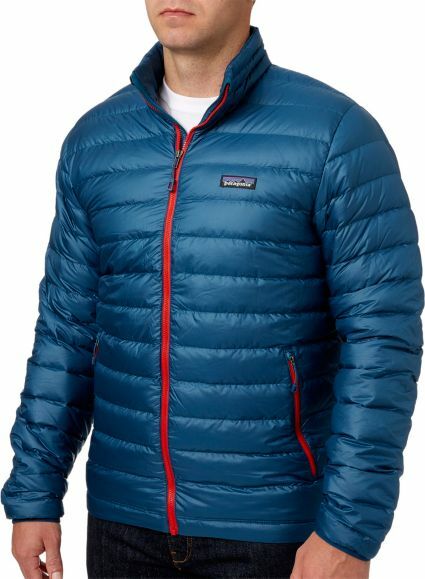 The popularity of Patagonia clothing and gear keeps rising. Lucky Wausau area shoppers can wrap up some awesome gifts this holiday after shopping at Shepherd & Schaller in Downtown Wausau, WI. Special orders of out-of-stock items are welcome. Shop Wisconsin’s Patagonia headquarters.